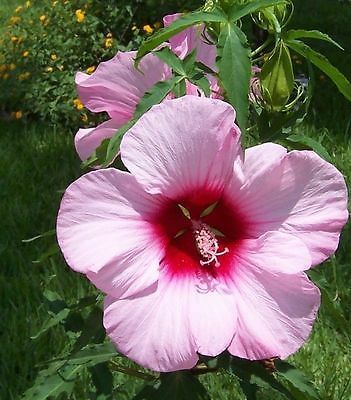 The hardy forms of Hibiscus are valued for their showy late-summer display of enormous satiny blooms. These flower best in areas with long, hot summers. Plants form an upright, bushy mound well suited to the back of a perennial border. Huge 8" blooms attract butterflies and bees. Wide spread bush needs 6 - 8 feet of growing room. Bloom late summer through to fall.